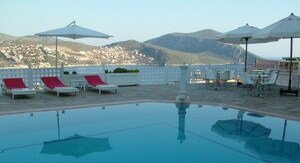 Kalkan's twinfold appeal stems from its fascinating historic surroundings and its scenic beaches. Beautiful Patara Beach is only a half an hour from town, in a lush sheltered valley offering eleven miles of glorious, white sandy beach against the clear blue Mediterranean. From the silent tombs at Xanthos to the vibrant village markets, from wonderful boat trips to sea caves, and the natural islands' ideal environment for swimming and snorkeling; this a great destination for those seeking a bit of everything. The town is small and charming, with a variety of restaurants. Compared to many of the other seaside resorts, the nightlife is tranquil. 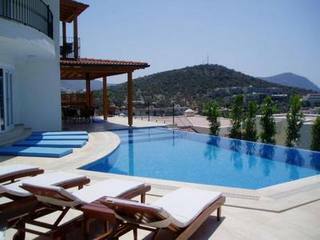 This is a large resort for Kalkan but it is built with a natural style (stones and lots of landscape) to fit in with the terrain. It is tiered to the sea which gives it lots of space as well as lots of stairs. This hotel is one of the best offerings for rooms and this year we are very happy to say the service has been tremendously improved from English speaking waiters to much more quality food being served. 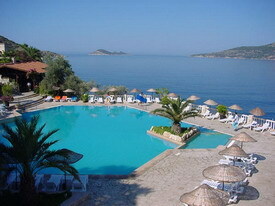 Still, we recommend enjoying meals in the wonderful restaurants of Kalkan. There are a wide variety of rooms which accommodate many different types of groups so please look in more detail for room descriptions and ask for help when making reservations. 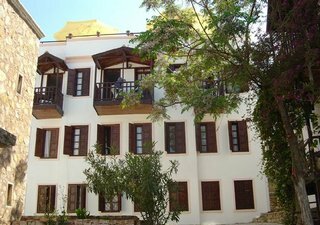 The Korsan Apartments occupy an excellent position on the hillside overlooking Kalkan, just three minutes' walk from shops and restaurants. 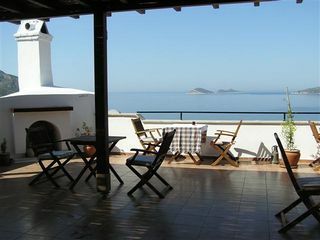 The apartments are set in three buildings surrounded by mature gardens with two small swimming pools, spacious sun terraces and a poolside Café that is open for breakfast, lunch, dinner or just drinks. A Rapsody of colors, flowers, texture and excitement as you walk up the few steps leading up to this really wonderful new boutique hotel in Kalcan. A half-moon shape structure surrounding a very large pool and Jacuzzi with unobstructed views of the mediterreanean sea... Stylistic patterns with vibrant colors cover the wonderful large cushions you find in the pool lounge area. Your eyes will be drawn to the unique chairs and lighting fixtures or just the simple glass bottles filled with interesting flower arrangements. One immediately knows it is time to lie in one of those lounge chairs with pockets in which you can stash away your mobile phone for the next 14 days if you are so lucky… A breakfast verandah offers a very stylish mediterranean breakfast with yummie temptations. As night falls the lights dim creating a very special atmosphere--one only can be there to see this. 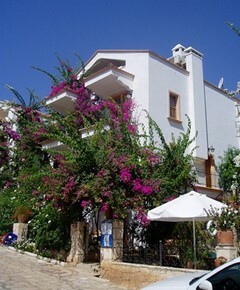 Truly a guest house in the traditonal and Turkish style. Walking in or out of this hotel you will find the warm hospitality surrounds you. All of this charm lingers with you as well as that wonderful home cooking that delights you at dinner. 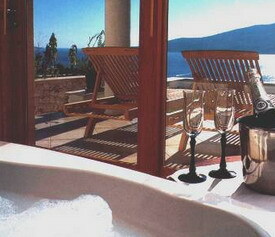 This villa enjoys a marvelous location and its privacy is augmented by excellent service. It has added A swimming pool with jacuzzi for the general use of all the suites and this is a very nice addition.Suites have the most beautiful umbrella showers with glass structures giving you a waterfall atmosphere (deluxe rooms). Also the sunset suite has a lovely garden lounging area with not only privacy but a wonderful solitude area for relaxing. The studio with private pool is the perfect room for any honeymoon. The White House, a local family run B&B, now in its 14th year, is ideally located in the heart of the village, wonderfully tranquil and yet just a few minutes walk from the town beach, beach clubs, harbour and town centre.